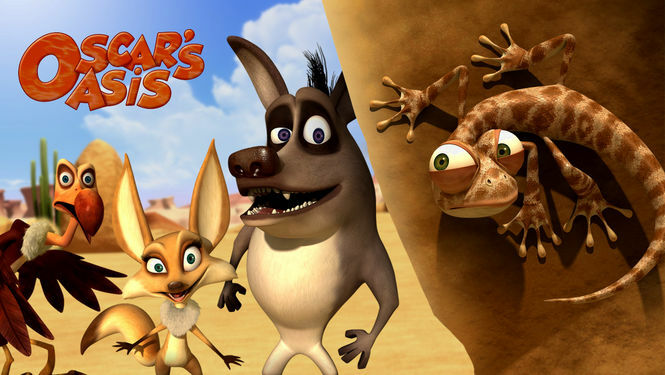 Oscar’s Oasis, for the school age set, follows the adventures of desert-dwelling, water-and food-seeking Oscar the lizard and the Trio – Popy the fox, Buck the vulture and Harchi the hyena – with whom he’s always competing for resources. Stuck in the middle of the arid desert, Oscar and his friends (and foes!) try to survive and, above all, not die from boredom in their endless quest to find water, shade, food, and something fun to do. Life can be tough for a lonely lizard and it sometimes seems like the entire world is against him – which, in the case of Oscar, it often is! – but he always tries to make the best of every situation. It is a great show with it's vividly colored computer graphics. Each show is only 7 minutes long. Oscar is an adorable lizard who reminded me of Scrat from Ice Age because it seems like everything is always against him. Poor little guy his tongue is always just a little too short to reach what he wants to eat. What I love about shows like this is that they are funny where everyone can be entertained. Young ones, old ones, and no language barrier as there is no words just a lot of sounds which everyone can relate to no matter what language you speak. Check it out on Netflix if you have a chance.